Although we adults may think of fairies as imaginary creatures, they’ve long been believed to be an integral part of the natural world. After all, folklore is filled with various tricks and techniques designed to please and pacify the wee folk. 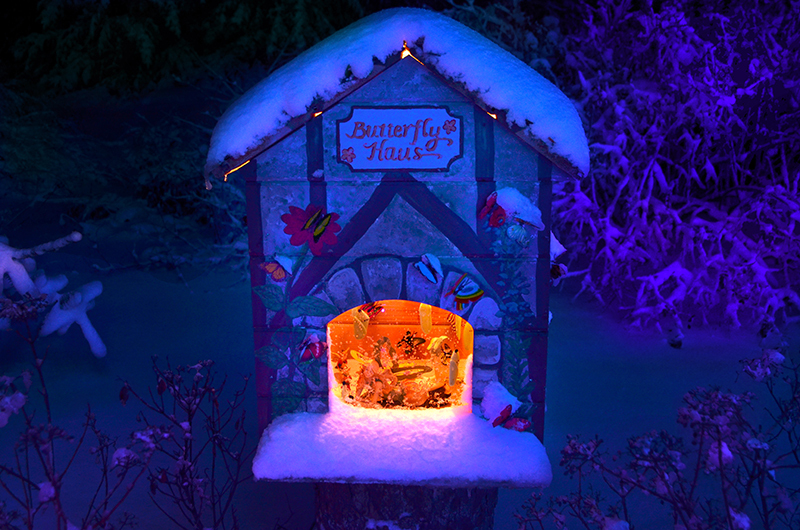 If you like the idea, you can easily craft your own tiny dwelling for the fairies. There are probably countless ways to go about it, but traditionally, these houses are built using natural materials found outdoors. Leaves, twigs, stones, pinecones, and pebbles are all good choices for building materials. Accents can be added using nuts, pine needles, feathers and flowers, or driftwood and shells. You can build temporary dwellings from scratch—lean-tos that disappear as the weather changes or the wind picks up. Or for a more permanent structure, you can take a page out of the Gardens Aglow strategy book by decorating an unfinished dog house. With this solid structure as your foundation, the only limit is your energy, the quantity of materials gathered, and your imagination. Past CMBG designs have included everything from found animal skulls, shells, birds’ nests and moss to fishing nets, sea glass, and lacy lichen. For a seasonal twist, try adding strings of cranberries, garlands of pine boughs, brightly colored cotton ribbon, scraps of festive fabric, or bits of lace reminiscent of delicate wings.